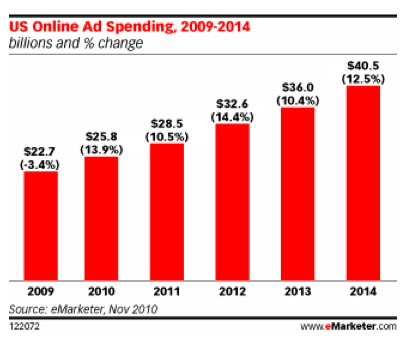 Online ad spending is expected to grow nearly 14 percent this year in the U.S. to $25.8 billion, according to a revised forecast by eMarketer. Its last forecast in May projected about 11 percent growth to $25.1 billion. The market research firm also expects U.S. online advertising to keep growing at double-digit rates through 2014, when it estimates the total will reach $40.5 billion. Obviously, these estimates are moving targets, and will be revised again, but they do give a sense of where expectations lie today. eMarketer arrives at its numbers by looking at other research estimates and coming up with its own meta-estimate. 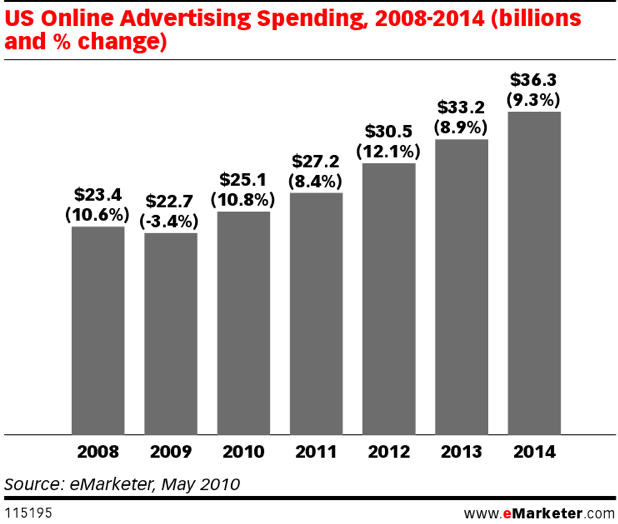 As a percentage of total media spending, the online component will grow from 15.3 percent in 2010 to 21.5 percent in 2014 (based on total media spending of $168.5 billion in 2010 and $188.5 billion in 2014).